[WIP][OXCE] United Nations Extraterrestrial Combat Command | v0.2e release! Join United Nations Extraterrestrial Combat Command! v0.2e NOW avaliable! WARNING: YOU REALLY SHOULD WAIT TO RESEARCH THE MARTIAN TECH TREE. In 0.3 it's going to be modified with new research topics and another mission. To install, you need first need to download and install OpenXcom Extended Then, just drop UNEXCOM folder inside your OpenXcom mods folder. Because I'm an Android player, one main goal of this mod is to be entirely playable on Android. 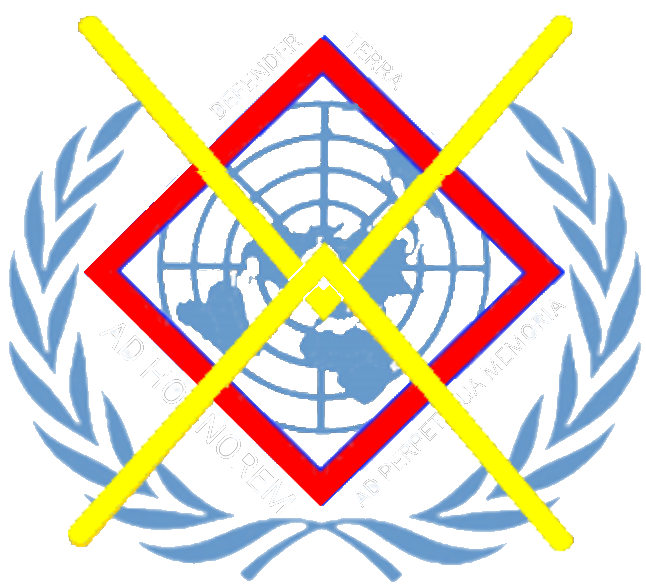 Please, follow the United Nations Extraterrestrial Combat Command on social media! First of all, Hello there! This is my first public released mod and i'm exited to announce it! This compilation was inspired by several sources. One of the main ones, as well as my reference source is the work of Hobbes in Area 51 and even more in Tech-Com, where I copied several codes. It's my favorite mod of one of my favorite movies. Back in 2015, I played a modified version made by myself of the Equal Terms mod in which XCOM troops used United Nations equipment. Unfortunately, that mod was lost, as my old PC. I was recently watching the movie The Siege of Jadotville and another source of inspiration emerged of this project, a force of the Blue Helmets fighting against aliens in the Cold War. Xenonauts is also inspiration of this compilation, for some concepts and part of its graphics, although it is not an attempt to copy that game. This mod is located chronologically right in the middle of the Cold War, almost at the end of the Vietnam War. There will be many pages of UFOpedia explaining the background of the story, as well as the course of the war. This mod is a compilation, not all the work is mine, as is obvious. I would call it a "franken-mod", because it is made of many different mods, united with glue, love and some things that I have done myself. This compilation is completely playable from beginning to end, but there are still many of my ideas to be implemented. Air combat is a very important thing now, inspired by Air Combat Rebalanced and Tech-Comm. Hangars can now host 2 crafts. There is a wide variety of aircraft and craft weapons of the time (and will come more, as well as a redesigned tech tree) It implements the HK features, a great addition made by Meridian. So expect to face UFOs actively trying to intercept your aircraft. You probably lose a lot of aircraft soon, that's why they will be somewhat cheaper. Also, you now can forget the ground radars. They are obsolete, actually I remove Large Radar and set the radarChance of the Small to 5%, just to mark the average combat range of your starting planes. Now you can (and you should) launch satellites to search for enemy UFOs and Bases. Be careful, they are reaaaally slow and HKs ate them for lunch. Ground combat is another important part. You will use realistic weapons of the time, such as rifles M16, AKM, LMG like M60 and Bren, snipers like XM21 and Dragunov among others. Each major power of the Cold War will supply you with unique tanks, weapons and equipment, you can choose to stick to the reliable Soviet guns or try the advanced NATO weaponry. Forget the outdated HWP, now you will be in charge of an M551 Sheridan, a BMD-1 IFV or a FV701 Ferret SC, light tanks that can really be transported on an airplane. Of course, an indispensable mod in any game, UNEXCOM includes Terrain Pack, so you can fight in different and beautiful terrains. There are new races (made by Solarius Scorch) and their weapons are now much more alien (drawn by XOPs), so the combat is more enjoyable. *To Marina, the woman who is always by my side supporting me. *To Hobbes, practically thanks to him is that I ventured into the world of modding when he allowed me to collaborate with his great mod Tech-Com, as well as Terrain Mod, an indispensable mod. *To KingMob4313 and Ickschuss, for his mod Equal Terms, one of my favorite mods of all times, of all games. *To the OpenXcom developers! They gave new life to a fantastic game. Without you, this couldn't be possible. *To Yankes & Meridian, for their amazing OXCE, for Meridian's Hunter-Killers and for answering my countless questions in the forum. *To Solarius Scorch, for the mods that I have added in this compilation and for the project The X-Com Files, my main source to get the sprites of Tier I weapons. *To bulletdesigner, Warboy1982, ohartenstein23 and davide, for your help in the forums! *To my clan of World of Tanks Blitz, the glorious 130th Armored Division (among them Alnoaht, Xzoria, KYIV94, Armisael, Gato Loco, Zayas) who were the first to try the mod. Thank you, Alnoaht! Basically he hunted most of the bugs before the release of v0.1. *To Biggieboy, for his compilation of buildings and for helping me with a request I asked him for. In the next updates I will add his buildings. *To Istrebitel, for his awesome mod Air Combat Rebalanced, from where I took various stats for the craft weapons and weapons itself. *To alinare, for his incredible source of codes and sprites in his mod The Endless War. *To Nord, for his recomendation about Android apps to mod OpenXcom, they are very useful! *To Yataka Shimaoka, Mitra Lightbringer, Valmont and his girlfriend, SIMON and everyone who play provide useful feedback. *To IgnisAbentorn, danielpembrink, garretrgang and all the kind players at mod.io. *To Wikipedia. Yes, much of the info about tanks and guns comes from here. *And finally, but not at least, to the OpenXcom community, for all the mods, the resources and all the available help. * For 0.3 there will be something really great for the mission to Mars. Put aside the little infiltration mission of the original game, I have planned something big, kind like the D-Day with touches of the Battle of Klendathu. Expect to find cameos. *Add Tier III aircrafts, craft weapons and tanks. Is this going to be a standup fight, sir, or another bughunt? *As I said, this is my first mod, so maybe they will be many bugs/glitches/errors hidden. This is a bughunt. *All of your suggestions are welcome! *Rebalance is needed. All your reports will be helpful. *Help to correct many translation errors and spelling. I am Mexican and I know Spanish and English, but sometimes I have some mistakes. Google Translate is useful, but I would appreciate support with spelling. All of the names, images, and other material used in this mod belong to their respective owners. Images found from the internet. 11.- Sprites from 40k mod, by bulletdesigner. 16.- Many weapons from X-Piratez, by Dioxine and The X-Com Files, by Solarius Scorch. 17.- HWPs from The Endless War, by alinare. 5.- Equal Terms Mod by KingMob4313 and Ickschuss. 18-Jun-18: 11:30 PM # Starting to add Tier I american weapons. 22-Jun-18: 12:27 AM # Finished add Tier I american weapons. Check for errors. HandObs missing. 27-Jun-18: 09:28 PM # Added ruleset plasma weapons to ET mod, alien weapons added. 29-Jun-18: 09:23 PM # MEDIUM SCOUT and LARGE SCOUT now have a 50% chance of being Hunter Killers. Speed of SMALL SCOUT (now 1500), MEDIUM SCOUT (now 2000) and LARGE SCOUT (now 2500) reduced. 03-Jul-18: 05:30 PM # Corrected flight distances of aircraft. Added double hangar. Fixed bug with M16 Clip. 04-Jul-18: 10:08 AM # Added Sentry and Fighter HKs in the campaign. Added RecycledAlienCollection in the campaign. 05-Jul-18: 05:18 PM # Added Linna Satellite, long range recon satellite. 19-Jul-18: 12:18 PM # Added NATO Tier I weapons: FN FAL, H&K MP5, H&K PSG-1, Bren, 30. Cal MG.
20-Jul-18: 10:26 AM # Added USSR Tier I weapons: AK-47, SKS, Dragunov, Makarov, RPG-7. 20-Jul-18: 12:31 PM # Corrected laser and plasma weapons palette. 31-Jul-18: 06:24 PM # Corrected listOrders, added Laser Tank tech tree with topics. 1-Ago-18: 07:19 AM # Fixed yaml-cpp error with extraStrings. Fixed new research topics, now Navigators & Engineers give UFO Classes info. (UFO classes, new UFO Types). Modified Scout class UFOS. 03-Ago-18: 07:15 PM # Corrected Legionnaire tank sprite. Falcon now has 500 damage (280 before), fixed craftWeapons available in store before researching NATO/USSR, Improved Craft Armor/Accuracy techs. 04-Ago-18: 08:27 AM # Now allied countries can come back to UNEXCOM after canceling an alien pact, after destroying the alien base inside the traitor country. 04-Ago-18: 05:42 PM # Added all Tier I weapons fire and reload sounds. Added sprayWaypoint behaviour to SMG and LGM. Various weapons/crafts prices fixed by Alnoaht. 07-Ago-18: 07:20 AM # Added Riot Armor w/ Angry Wife, custom sounds and research. 11-Ago-18: 06:18 PM # Added Delta Armor w/ MG3, custom sounds and research. 15-Ago-18: 03:22 AM # Corrected M551 Sheridan & BMD-1 tank sprites. Modified tank armor. Modified startingBase to Defensive, added M203 grenades to startingBase. 13-Oct-18: 07:48 PM # Fixed bugs found by IgnisAbentorn, renamed AK-47 to AKM, reemplaced Makarov for Stechkin Automatic Pistol, fixed stats and fire sound. Changed FN FAL & M16 M203 alt fire mode from confSnap to confAimed, to avoid reaction fire with underbarrel addons. 14-oct-18: 05:30 PM # Updated operationType: 6 to Alien Interception missions, now Hunter Killers take off and land on their bases. If I missed someone, do not hesitate to let me know and I will credit you immediately. If you liked any of my craft sprites, weapons or UFOpedia images for your mod, feel free to use them! Just credit me. Welcome and congratulations for your project. As far as I'm concerned, use all the resources you need from my mod without restrictions. Thank you so much! Enjoy, any suggestions are welcome. Haha well, I couldn't make a mod set in the 70s without adding CCR. :') It's a must-have. Any suggestion and/or feedback is always welcome. The M60 sprite suggests that it should take 2x3 slots, instead of 1x3. The same goes with the M60 belt, which is a 1x1 but the sprite suggest 2x1. Using the new "Sheridon" tank is awesome and in the same time displeasing. This tank is too op and can soak up shots more than a hovertabk can do. This new tanks just makes early to mid game Waaaay too easy. Forgive me thy mod, but I feel this one should be separated. During examination of the ufopaedia, I experience a game crash after I pressed the next button on the page of the small radar, if I am correct, the next topic will be the large one, since the large radar was removed, such crashes shouldn't exist, unless if it wasn't purged out entirely. And a question: Can we save Earth without destroying it? All we ever wanted after this war is the events of Fallout right? In that inventory screenshot, I see you made a little mistake, there is an unconscious soldier but we don't see the proper bigob, instead it is represented by the grenade launcher bigob (Though its cool to think that once a soldier dies, they transform to weapons). I'm working to solve the inventory glitches and the Craft UFOpedia pages. I didn't notice the "grenade launcher human being", I'm fixing it. About the Large Radar UFOpedia page, I forget to remove them from the ruleset. Also working on that. About the Sheridan, it's meant to be a powerful tank, it's main gun fires 152mm shells and uses Shillelagh guided missiles. In my tests, a Cyberdisk resisted 2-3 Shillelags and 3-4 shells. But it's correct what you say, it's very OP. I'm going to increase it's cost (both tank and shells) and also decrease it's armor. It's supposed to have an armor as thick as wet toilet paper, after all. Talking about saving the Earth with nuclear weapons , the Falcon nuclear missile (and soon, the Genie rocket too) is very powerful and can annihilate small UFOs, if you can get close enough. I wish that could be possible to make some penalization to the score for the use of this kind of guns, to reflect the concern of U.N. about nuclear explosions right in top of their heads. And oh, at the start of the game, just give the players 6 pilot units, so we can easily assign them to the crafts where they rightfully belong. I've fixed your reports (except for the starting pilots, I'm still working on these), but I'm not at home. Would you like to wait until the release of 0.2? Or you would like me to attach the fixed rulesets here tomorrow? First I wanted to thank all the modders and Efren for all their amazing work. As a seasoned Xcom player I wanted to introduce my GF to Xcom but also spice things up for me. I found this mod's theme, time and features to be the exact right mix for both introducing new players to the Xcom formula while also making it more interesting for veteran players such as myself. - Interceptor planes' fuel is WAY WAY WAY too low. Looking at the files I found them to be around 120-220 for the most part and it was making the game a chore to play. On out first 40 min run we only managed to down 1 (one) single small scout UFO with two bases! - I suggest at least doubling each of the planes' current fuel capacity. You see, UNEXCOM being a whole WORLD initiative it is only fair so that all UNEXCOM crafts to refuel on any airport of any supporting country. Since it would be a mess to simulate this you could just increase fuel capacity. - Increase fuel consumption when crafts are flying over hostile countries while reduce fuel consumption when flying over NATO/RUS countries. The fuel tank increase addon that you can buy only gives 50 additional fuel capacity which is nothing and barely even noticeable. It should give at least 150 or more fuel capacity specially considering it takes one weapon slot. Right now there is no logical reason to get one over a weapon. Everything else seems quite balanced but I will be posting more feedback as we play more. Hello! Your ideas are great! But the problem is that no such feature exist. Sorry.